It all started last August when we were vendors at Chicago Market Days and Keith LaBelle approached us with an idea. 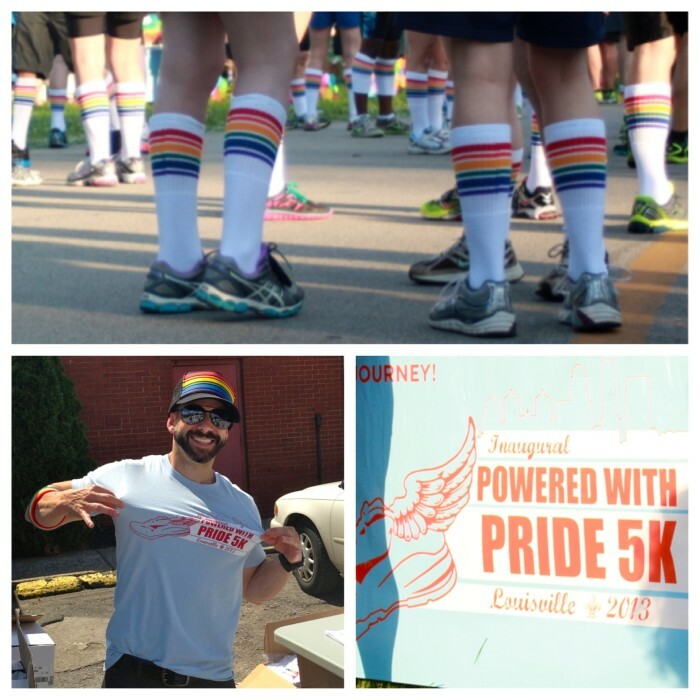 Months later, I received a follow up email from Ketih and months later, the ball started rolling; ‘Powered with Pride 5k’ in Louisville, KY was born! I was in love with the idea, a 5k with everyone wearing Pride Socks! According to Keith, they wanted “a 5K dedicated to solidarity, unity, community and healthy living both physically and mentally. A celebration of sorts…a true point of pride” and that it was! I had no idea what to expect or the feelings I would feel but on June 15th, we pulled up to the race about 40 min before start time. As the runners continued to show up, the feelings of pride continued to build in me. As the owner of Pride Socks, to be surrounded by 450 people wearing Pride Socks, accomplishing the very essence we built the brand on, is my Proudest Moment! It was truly amazing to see and be a part of an inaugural race where unity, community and positive living was expressed. When Pride Socks was in the making, I wanted to build a brand that empowered people to be proud of who they were. It is my belief that if you are proud of who you are, you will chase and accomplish your dreams. For me, this belief started when I was a sophomore in high school when my sister discovered I had a running talent and pushed me to join the cross-country team. Not only was my running talent discovered that year but so was the fact I had zero belief in myself. I had no idea what it meant to be proud or feel that sense of pride until my coach continued to push me time after time because she saw something in me I did not. After years of her pushing me, it sunk in and I finally felt what people talked about and I too could put a gigantic smile on my face and stand tall. Once I knew what it felt like to stand tall in pride, I also knew if I could do it, anyone could. I grew up in a home where I was one of five siblings, born and raised by Deaf parents. The challenges my family faced inexplicably bonded the seven of us, which established my appreciation for diversity in others. Through my challenging upbringing and my new belief in who I was, I knew I could accomplish whatever I set my mind to do. In closing, I am proud to be the heart of a brand that encourages, motivates, and supports individuals to take pride in who they are. When you believe in yourself, you exude a positive energy that attracts others, inevitably serving as a catalyst for others to make positive change for themselves as well. For me, being a part of all the runners in Louisville wearing their Pride Socks, is my Proudest Moment! I also put together a video of the race if you want to see what I experienced! Cheers!